We had plenty of fun with the KingQuad 500AXi on our forest trails. The engine has the guts to make you smile. The handling trends towards the nimble side. Suzuki was the creator of the modern quad. 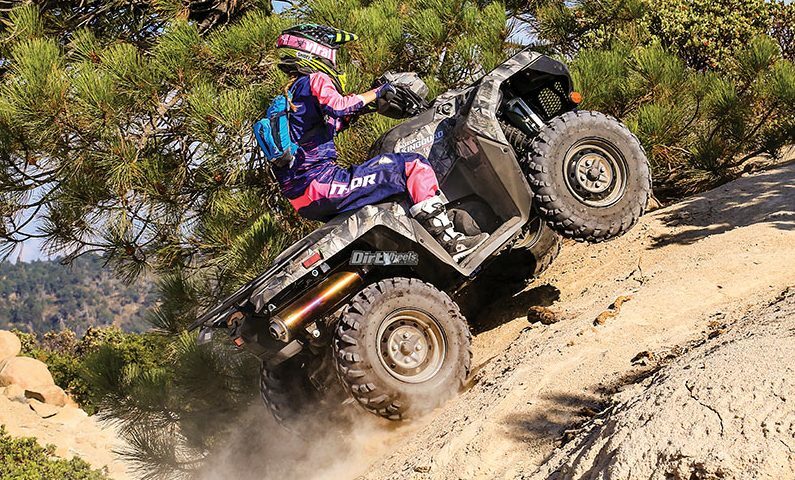 During a time of three-wheelers, the difference a quad made was simply stunning. The upgrades came fast after those early quads, and in many cases it was Suzuki coming up with the innovations. Recently, though, the Suzuki quad line-up has been unchanged for too long. 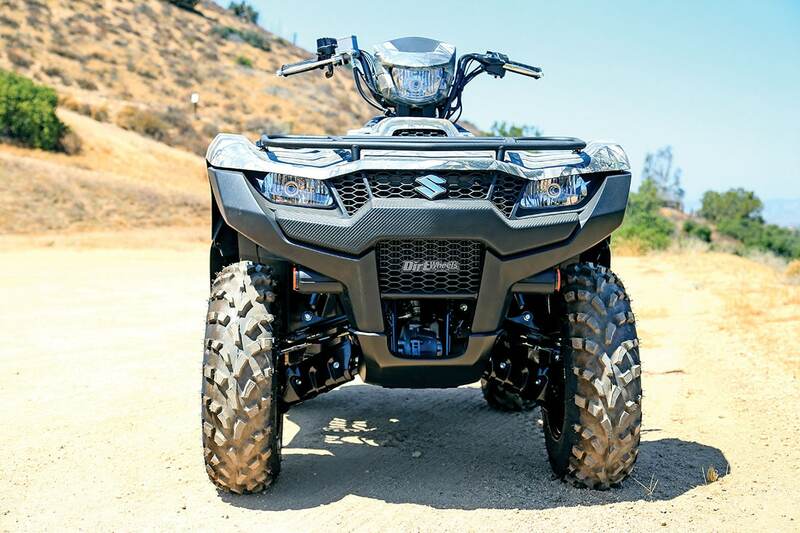 Never fear, an all-new 2019 Suzuki KingQuad 500AXi is here, and it is a welcome revision of a model that we have always liked. With the KingQuad 500AXi, Suzuki kept the best parts with intelligent updates and designed all-new parts where needed. For example, the engine has few changes aside from Advanced Suzuki Fuel Injection tuning for improved throttle response and fuel efficiency while ensuring improved engine starting. We suspect that U.S. emissions compliance motivated this tuning, in addition to making sure the 500 conforms to California’s stringent evaporative emissions standards. The base 500 AXi has manual steering and steel wheels. Next up is the 500 AXi Power Steering. The toll for the power steering is a $1200 jump in price and an added 40 pounds, but in our opinion well worth the cost. Our test unit is True Timber Camo, and that boosts the price an additional $400. An SE model gets aluminum wheels and EPS. You get matte-painted bodywork in addition to the EPS and aluminum wheels with the SE Plus. There is also a Rugged Edition that also comes standard with power steering, mud flaps, a matte black color, and tough front and rear bumpers. It is $100 less than our camo model at $8999. Suzuki made sure that the front end has plenty of approach clearance and a smooth front fascia. The three headlights make night riding fun. This is a familiar engine that has been refined. When the engine was designed, Suzuki leaned the top end forward to lower the center of gravity. The smooth and willing 493cc, SOHC, single-cylinder, liquid-cooled four-stroke engine is tuned to produce a wide powerband with strong top-end power. The engine also features a balancer shaft for smooth operation. We can’t fault the Quadmatic CV-type automatic transmission. CVTs are unfailingly versatile and convenient, and the fender-mounted gate-type shifter is easy to use selecting high, low range or reverse. Its engine-braking system minimizes off-throttle free-wheeling to help control on steep descents. Sturdy rack, ample storage, taillight, quiet exhaust, larger and improved shocks, and ample suspension and axle protection all come standard. 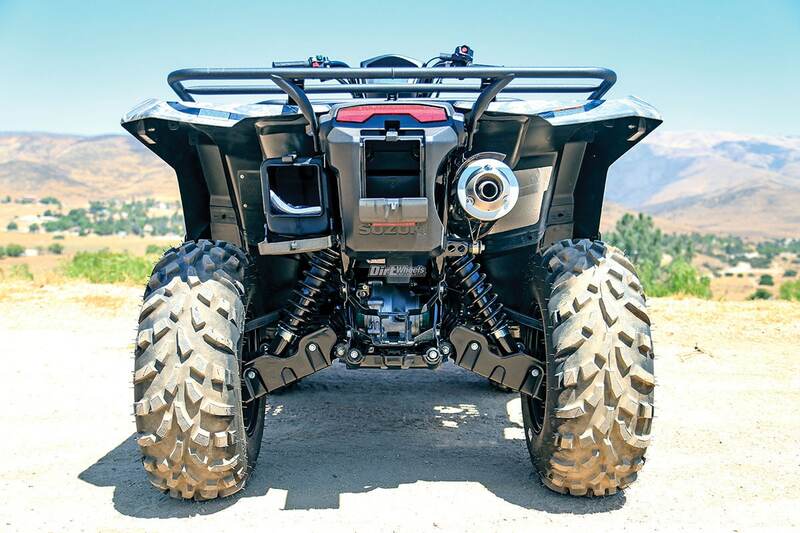 Even though any owner of a 2018-or-earlier KingQuad 500 will immediately feel at home with the 2019 machine, the frame has significant changes, such as thicker frame tubes and beefed-up suspension mounting points. The rear of the frame includes a built-in receiver-type hitch rather than the flat plate found in the past. A plate allows mounting a tow ball, but the receiver allows mounting draw bars with differing heights for different towing applications and mounting equipment. Between the frame and hitch changes, the towing capacity is improved to 1322 pounds. 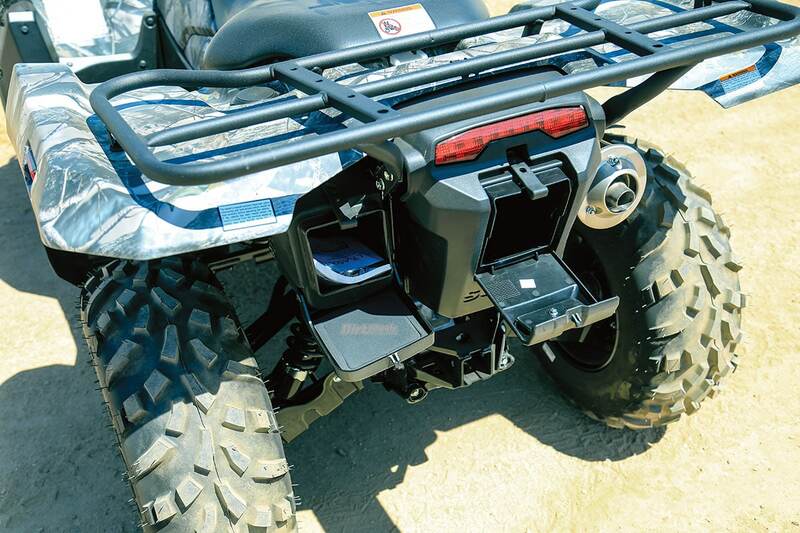 The upgraded frame allows greater rack capacity—66 pounds front and 132 pounds of rear cargo. Storage compartments are a twofer. We used both quite a bit, and found them easy to use and secure. Suzuki paid a great deal of attention to the handling and steering. According to Suzuki, “The base steering characteristics are now tuned to an under-steer condition for reduced effort and tighter turning in tight conditions.” We have experience now with both the manual steering and power steering models, and we can say that this change has made a difference. We definitely prefer power steering. It is claimed to have 40 percent more assist than before, but it merely feels like easy steering. There is none of the numb steering that we associate with overly aggressive EPS. Five-position preload collars are the only adjustment on the new larger gas-charged shocks. Damping force is increased as well. Control is aided by a rear stabilizer bar that is refined in shape and strength. It is located with bushings that have more give to them than in the past. Wheel travel is a modest-in-class 6.7 inches of travel from the A-arm IFS, but the independent rear suspension has 7.7 inches of wheel travel. Ride compliance is actually quite good. Riders with small hands wanted a longer thumb throttle. 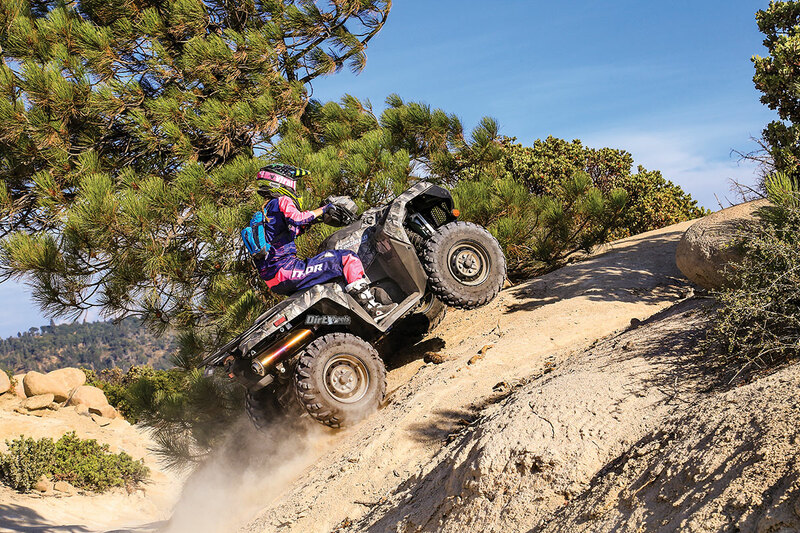 The 4×4 and diff-lock controls are right where you need them. Suzuki dressed the 500 in new bodywork blessed with high-clearance fenders that protect the rider. We want to roost our friends and not ourselves! In addition to the updated styling, and impressive fit and finish of the new body parts, Suzuki refined the access panels used to check the oil level and service the air filter. The body is about more than protective fenders. The whole front of the machine has a smooth profile that should shrug off brush and such. 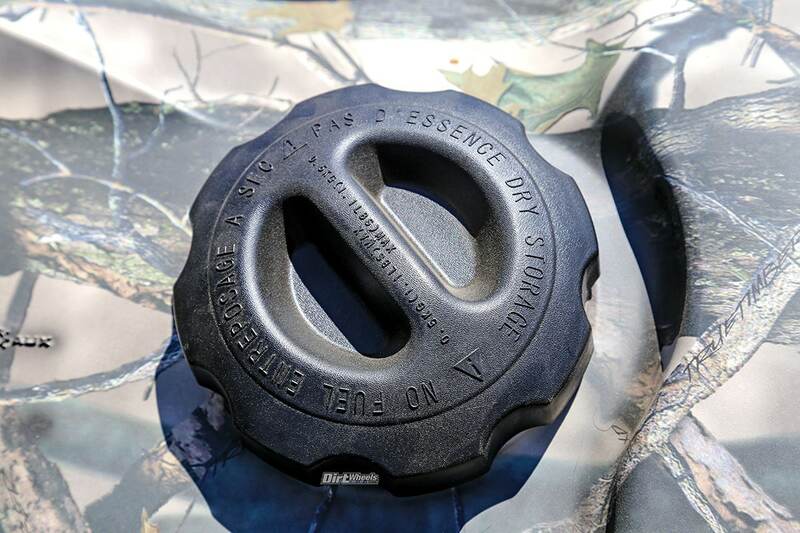 There are plastic skid plates we put to the test, and they include A-arm protection. There is a small waterproof storage container in the right front fender, and there are two larger compartments at the rear. The larger middle one is close to the exhaust, so avoid heat-sensitive cargo in that one. The brake pads and brake lines have been improved, and the leverage on the master cylinders has been refined. The fronts are hydraulic disc, and the rear is a sealed and oil-bathed multi-disc brake. The rear actually more closely resembles a traditional clutch than it does a typical brake. The beauty is that the brake is sealed and cooled by oil, so it cannot get contaminated with mud, water or chemicals. We would like more power and feel, and we have faded these rear brakes with spirited riding. Handlebar-mounted push-button controls select 2WD, 4WD and differential-lock 4WD. 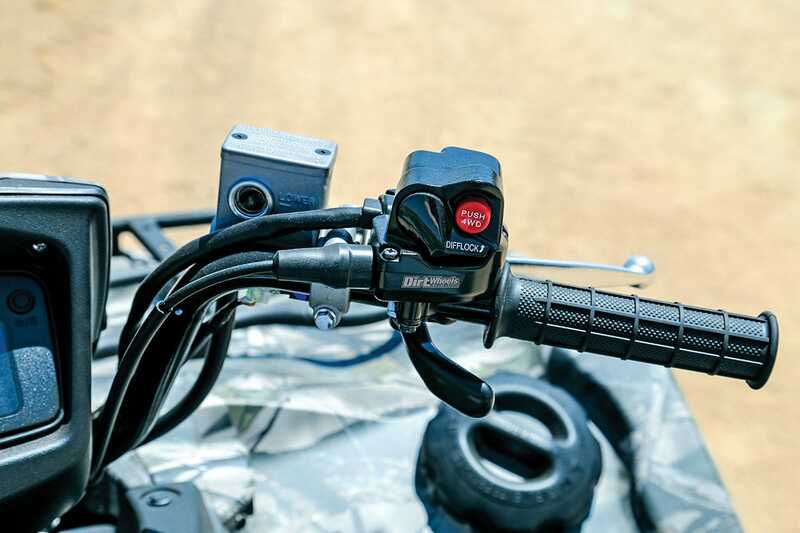 Speed is limited in diff-lock, but an override button on the left handlebar allows full power for deep mud. A redesigned multi-function instrument panel provides LCD readouts for speed, odometer, twin trip meter, hour meter, clock, fuel level, driving range and drive mode. LED indicators for high, low, neutral, reverse and 2WD/4WD and differential-locked 4WD keep you aware of what is happening with the machine. Plus, there are warning lights for fuel injection and engine temperature faults. This waterproof storage on the front fender is small, but we used it every time we headed out for a ride. It is easy to use from the saddle. We spent miles on the KingQuad in a variety of conditions. While we looped OHV trails in the forest, we were on routes that see a lot of traffic, so the going was rough with some whoop sections and a lot of loose and buried rock. Suspension quality was quite good at trail pace. You are isolated from the trail irregularities quite well. Start pushing the pace and you will hit the limit of the stock suspension and, eventually, the rear brake. We don’t see a large percentage of KingQuad users going in for 10/10ths race pace. Certainly, the steering geometry is happier at tighter and technical riding than it is at high-speed running. Since the 500 and 750 basically share a rolling chassis, at first we had to wonder who would choose the 500? When you first stab the throttle, the 750 has a chunky torque feeling to the response that is very satisfying. The 500 is smoother and more linear in delivery, but honestly, the difference was quite mild. In our back-to-back testing, the 750 had manual steering and the 500 had EPS, and not one rider wanted the power enough to give up the power steering. The price difference is roughly 10 percent. Suzuki’s KingQuad 500AXi has always been a nice package, but for 2019 it is better than ever. It is more than at home handling tasks on a country property. 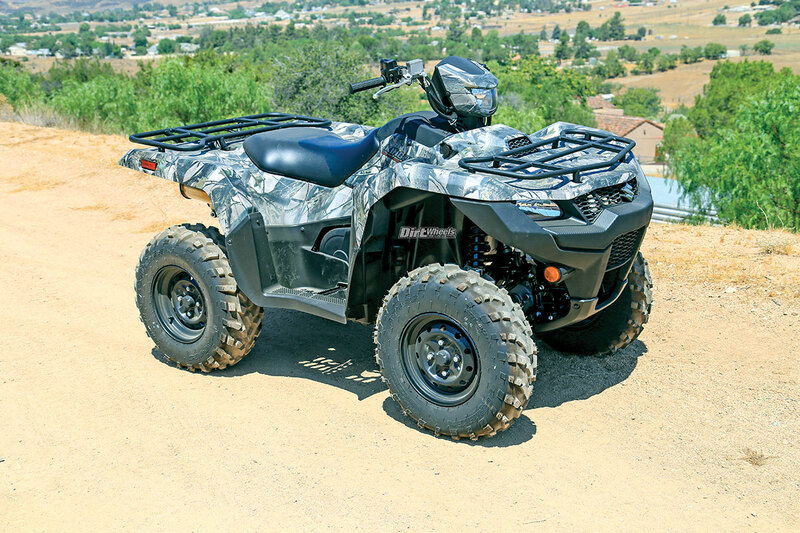 With all CVT-equipped 4×4 quads, the standing riding position is wide at the floorboard area, but the KingQuad isn’t bad at all. We had the chance to do a lot of standing riding. We needed a second machine for a trip to the Idaho dunes, and the Suzuki happened to fit on the trailer with our UTV. Even though it is totally not aimed at dune running, it worked quite well. We could feel the weight on steep, fluffy cambers, but otherwise it accounted itself well. It was certainly happier on the forest trails and roads. It is plenty nimble, and normal 4×4 and diff-lock performance and control are very good. We tried some more aggressive eight-ply tires with good results. They made the handling more solid, but passed more of the trail to the rider. 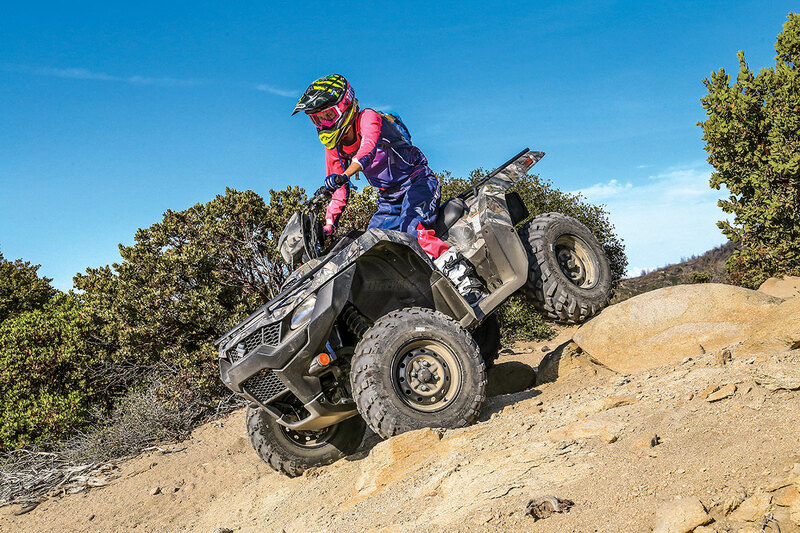 For exploring, hunting, fishing, camping or work, the Suzuki is ultra capable. It is very comfortable to ride, and the cockpit is roomy with nice hand controls. Riding at night is easy with both fender-mounted lights and another up higher that turns with the handlebar. Standing is easy and comfortable, and we ran over plenty of things that made us glad for the plastic undercarriage protection. 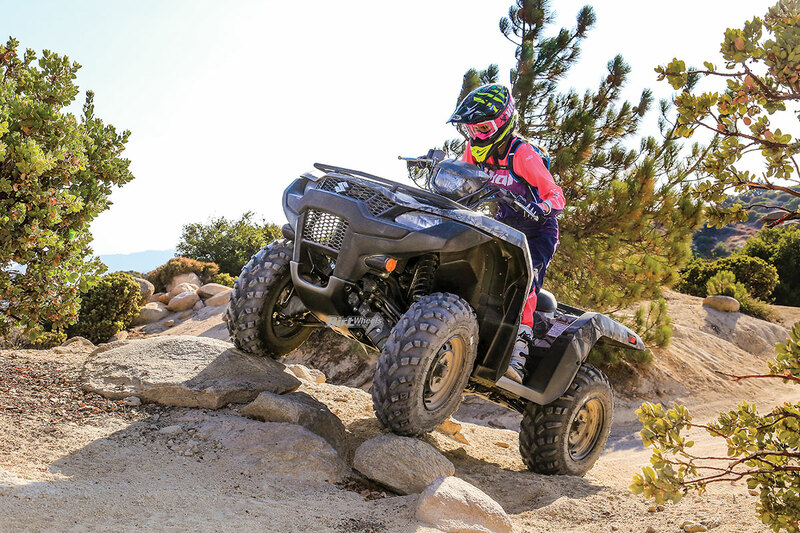 All 4×4 quads fall somewhere on a graph, with utility on one side and fun on the other. Clearly, the Suzuki is more tool than toy, but it is plenty capable at producing grins on the trail. And there is nothing wrong with a hard worker. We like the 12-month limited warranty, the smooth power delivery and the riding position. Suzuki freshened up the look, solidified the rolling chassis and dialed in the details compared to past KingQuad 500s. We are continuing to pile on miles. You can see it now at your Suzuki dealer. Going to www.suzuki.com will also get you to the new machine and the rest of the ATV lineup! There is a pleasant amount of engine braking on tap. It aids the brakes on tricky descents. For our terrain we could have used a more aggressive tire tread pattern.